Some of my students are starting to play weddings and they are filled with questions. I’ve played many wedding over the years but I remember how nerve racking the first few were. If only I had a small guide and list of tips! So, here’s some tips for any first timers to the wedding scene. You’ll need to know how weddings work, recommended music to play, as well as some important tips about collecting money and more. 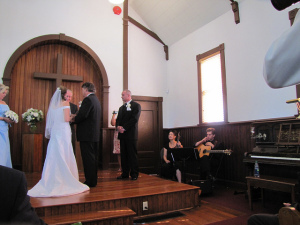 How does the music work at a wedding ceremony? Before the ceremony: Usually some light background music in classical or jazz styles. Stick to major key works, no wants to hear your sad minor melodies even if you think it’s beautiful. It’s a happy occasion and you want to contribute to that atmosphere. Seating of family: If it’s a big fancy wedding there might be an official time when family and other honoured guests are seated, usually the musician just continues playing light music. Remember to play light cheerful music in major keys. Nothing too impressive, people are here for a wedding not a concert. You’ll want to discuss all the music selections with the bride/groom for the sections listed below. How to start: If you can’t see the beginning of the aisle because of where they put you then tell the minister/justice of the peace to give you a nod when it’s time to start each section. Or, ask to be placed where you can see the beginning of the aisle. Also tell the minister that you will stop playing with about 10-30 seconds of everyone arriving at the front. In a way, you are running the show because music lets the wedding party know when to walk. However, they often are not paying close attention to the music so you may have to watch for who’s walking. Groomsmen and Bridesmaids first: Sometimes the groomsmen and bridesmaids will walk down the aisle in pairs. However, at other times the groomsmen and groom may simply stand at the front and let the ladies walk the aisle alone. Bridesmaids commonly get their own music. Flower Girls/Ring Girl: Often a young child. This kid is carrying the rings. Often get’s her own music but sometimes just walks to the same music as the bridesmaids. On occasion it can be a boy too. Bride: The bride walks the aisle accompanied by her father or other family member. She almost always get’s her own music. Usually you have time to switch pieces but the bride might just start walking before you start. Keep an eye out for her so you can switch to her music the minute you see her. Minister/Vows: Basically a bunch of talking. Musicians will need to stop playing within about 30 secs of the bride reaching the front so mark on your music good places to stop. No music is played while they talk. Musicians sit still, smile, and be quiet. Sometimes they don’t wait for you to stop so be prepared to cadence at any time. Signing: The signing is when the bride, groom, minister, and witnesses go sign the wedding document. There is usually music here. People are often quite quiet so they will actually listen to you, pick something you’re comfortable playing. Pronouncement: Some final words from the minister, then to the kiss. Walk away: This is when the bride and groom et al leave the altar and walk out via the aisle. It can happen literally right after the kiss. People are often clapping and cheering so you’ll barely be heard, however, you want to add to excitement so play something cheerful and exciting. If the aisle is super short (say it takes only a minute to walk) then you might play less selections, maybe only one some for the bridesmaids/flower girl/others and then only one for the bride. On very rare occasions you may only play only one piece for all groups. On other occasions something else happens during the signing such as a reading of a poem or music by a family member. Always ask: Heavily religious weddings can have many rituals or events as well as additional requirements. Always ask beforehand what will take place at the wedding. Talk to the minister beforehand if needed. When in doubt, attend the dress rehearsal. Prepare: You should prepare a wedding book with music for: the bridesmaids, flower girl, bride, signing, and walk away. You’ll be able to use this for years to come. I’ll give suggestions on music later in this article. Tell the bride and groom what music they want: I know this sounds silly but you should tell them that you have an excellent selection that would be perfect for their wedding. If they choose the music then you might have to really work hard to prepare it and be nervous about it. It also might be horrible music and when you play it everyone will think you choose it. It’s their wedding and up to them but I recommend to steer them in the right direction. Just let them know right away that you have some beautiful pieces that work great for walking or the mood of each part of the wedding. Traditional music is commonly used for a good reason, it works perfectly! Buy a Book: You can check out some Wedding Books for classical guitar via Amazon. Here are some common works but add your own because some people want something unique and pretty that isn’t used for every wedding they’ve ever been to. Processional: “Trumpet Voluntary” (J. Clark); “Trumpet Tune” (H. Purcell) ; “Jesu, Joy of Man’s Desiring” (J.S. Bach); “March” from Occasional Oratorio (G.F. Handel) are all good choices. If the bride is not using the “Canon in D” by Pachelbel then you can consider using it here. For Bride: “Canon in D” (J. Pachelbel); “The Bridal Chorus” from Lohengrin (R. Wagner); “Allegro Maestoso” from Water Music (G.F. Handel); “Rondeau” (J.J. Mouret). Sometimes the bride will choose something. Anything that is walkable and played as ‘the most special piece of music ever’ will work. They will likely want to hear this piece beforehand. For the Signing: My favorite is “Ave Maria” by Bach/Gounod. It’s perfect, major key but with lots of key areas and sections. it’s somewhat reflective and peaceful. Jesu, Joy of Man’s Desiring is also great. Anything will do but save the energetic stuff for the walk away or the after party. Walk Away: Something cheerful and exciting. However, people will often be clapping and cheering so it won’t matter too much. Any classical fanfare or bright major key piece works well. “The Wedding March” from A Midsummer Night’s Dream (F. Mendelssohn); “Ode to Joy” (L. Beethoven); “Hornpipe” (G.F. Handel). How Much to Charge for weddings? Base Rate: I suggest you charge a great deal for the first hour and then reduce the cost for future hours. This way, if you only get hired for an hour it will be worth your while. So maybe if you’re playing solo (just you) charge $200 for the first hour and then maybe only $100-150 for more hours. Remember that you’ll have to get to the location, bring your gear (music stand, amps if needed), practice (depending on your experience), and any additional planning. It will all take time so get your money’s worth. You’ll still likely be the cheapest thing on the wedding list. Trust me, wedding are work and you need to get paid well. Also remember to charge high and if they don’t go for the price then lower it later. Weddings are expensive so your price is likely way less than most of the other costs. Charge extra for music requests: If you play lots of weddings then you won’t have to practice your music much. However, if they request a song you might have to arrange it yourself. I charge $50 extra for specific songs but it depends on how easy it is. Charge extra for the dress rehearsal: This is pretty much like playing another gig except without the pressure. I say charge half price. Money arrangements: Make it clear that the money should be put in an envelope and given to a family friend to pay the musicians. The last thing you want to have to do is interrupt the bride or groom for money when it is your time to leave. They are too busy to remember you on their special day. Try to get introduced to the person who will pay you upon arrival so you know what they look like and can go to them for the money. Music selection: Trust me, people don’t know what they want or what they are doing. They might think they have an idea such as “an Italian wedding” but when you play them Italian music it will likely not be what they are thinking. Therefore, have a prepared selection of works and tell them to choose from it. Let them know that the pieces are beautiful and that you think it will go well with their wedding. Make yourself the professional and tell them you have what they need. Bring Business Cards: Bring business cards to hand out and put on display. More importantly, give your business cards to the wedding planner, the venue manager, and the catering company. These are the people that put on hundreds of weddings and you want them to recommend you to their clients. There’s not much point giving your card only to the bride and groom since (hopefully) they will not be getting married again anytime soon. Requirements: Tell them of any special need you have. For example, I play classical guitar so I need a chair with no arms. I also use amplification for I sometimes need a plug in (if I’m not using my battery powered amp). Inside or covered only: Let them know that you will not play outside in the rain (even if it’s sprinkling) since it will ruin you instrument. Don’t worry about your performance. Everyone is there for the wedding, not the music. If you make small mistakes it is likely no one will notice because they are focused on the bride and groom. An believe me, the bride and groom likely can’t hear you because they are busy with each other! Work out your rates and any special requests before agreeing to play. Work out the music for the ceremony, be the professional and steer them in the direction of music you play well instead of multiple requests. Make sure payment will be given to you via a family member or friend so you don’t have to bother the bride/groom after you are finished. Working Guitarists: Any more tips and suggestions? One additional thing I have found helpful when I am playing before the service is to be ready for the bride to be late. It doesn’t always happen but it happens often enough. This means if I am asked to play for 20 minutes before the service begins I will prepare 30 minutes or more music just in case. An alternative is to simply repeat the pieces you’ve played at the beginning of your prelude until the big moment arrives(or do a combination of both). Most of the guests would not have arrived to hear the beginning of your set and so the pieces would still be “new” to most of the congregation. I didn’t know bands usually charge more for their first hour than subsequent hours. My brother is getting married and we have been thinking about getting him a live band within our budget. I’ll have to consider your tips so we can get the best band possible. It’s totally random, I do this to make sure if the client only books me for an hour that my travel time is disruption to the day is covered. I have not idea if this is a standard practice.